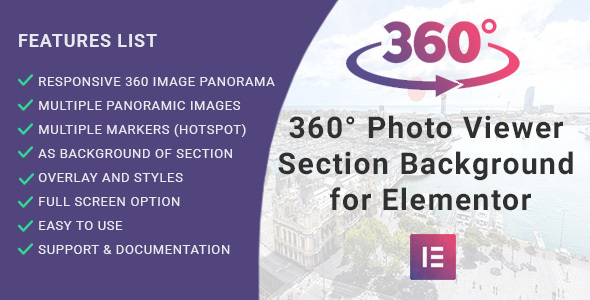 360o Photo Viewer – it’s very good viewer of panoramic images for Elementor and WPBakery Page Builder. With the help of this plugin you can easy create a virtual tour for any locations. Also, you can mark products on the panoramic image thanks to Woocommerce support. it is possible to create markers with templates and display information from a post or a product. There are unlimited number of markers and for all of them there is an opportunity to set the action when you click. Also, Its special feature is setting up panoramic image on section background which is an excellent replacement of video background. Create in a few seconds nice blocks with panoramic images to present your rooms, buildings, etc. Please use links below to try our plugin. Multiply panorama photos – unlimited amount of the panoramas on the page. Virtual tour – you can show an unlimited number of locations and add as many markers as want to them. Gallery – you can use the virtual tour scenes as a gallery. Support woocommerce – you can mark products on the panoramic image. Markers – mark the people, buildings, landmarks and so on on the photo and add some information about them. HTML and shortcodes are allowed. Responsive – thanks to Elementor page builder and Fullheight parameter your panoramic image will be working great on all the resolutions. AutoRotate on Start – automatically starts the animation of the rotation. Blend mode – combine the colors of image or overlay color with panoramic image. In this case this allows to create styled panoramic images without editor. We are in the process of a new version development. New features, which will be available, you can see on our demo in the section “Coming soon”. Also, we would like to get your recommendation regarding these functions realization. Please, write your suggestions in your comments.